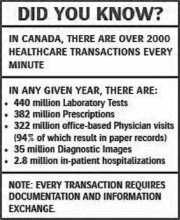 November 13, 2007 | Creation of Canadian electronic health records (EHR) system could save billions in costs annually. President of Canada Health Infoway predicts huge reduction in need for diagnostic tests, fewer days in hospital. Richard Alvarez, President of Canada Health Infoway, the country's planned health information sharing program -- said that more effective information management through the use of IT could reduce national health care costs by $6 billion to $7 billion Canadian, or about $6.24 billion to $7.29 billion, annually, Charlottetown Guardian reports. The savings would come from reducing hospitalizations based on unnecessary drug interactions and a reduction in duplicate diagnostic tests, the Guardian reports. 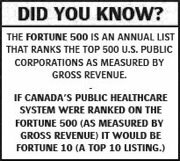 The Canadian federal government plans to invest $1.6 billion Canadian, or about $1.66 billion, into Health Infoway and leverage another $1.6 billion Canadian, or about $1.66 billion, from provincial and territorial governments. "This is a $10 billion (Canadian) project all told by the time it is completed and we expect that to happen over the next 10 years," Alvarez said. Alvarez said the nationwide health IT program will "start with hospitals, then pharmacies and community clinics, and probably the last to come on board will be family doctors' offices" (Original article from Charlottetown Guardian, 11/13). Nearly two-thirds of U.S. adults believe that the benefits of electronic health records outweigh the privacy risks, according to a new Wall Street Journal Online/Harris Interactive poll, the Wall Street Journal reports. Three-quarters of the survey's 2,153 respondents said they agree that patients would receive better care if doctors and researchers were able to share information more easily through electronic systems. Similarly, 63% said that using EHRs could reduce medical errors, and 55% said EHR sharing could reduce health care costs. However, about 25% of respondents said they are unsure if EHRs can provide these benefits. The survey, which was conducted between Nov. 12 and 14, also found that about 25% of respondents said they currently use some form of EHR. Of those, 23% said the EHR is maintained by their physician, while 2% said they created and maintain their own personal health record on their computer. Fifty-six percent of respondents said they do not have an EHR, while 17% said they are unsure if they have an EHR. The poll indicates that privacy concerns still remain among health care consumers. Half of those surveyed said EHRs make patient privacy more difficult to ensure, down from 61% in 2006. Twenty-five percent of those surveyed said EHRs would not make it more difficult to ensure patients' privacy, while another 25% said they were unsure.